"Murder, Morality and Madness: Women Criminals in Early Oregon takes a peek at an often overlooked part of western history. The Victorians were quite adept at keeping immoral or bad behavior a secret. Goeres-Gardner does a wonderful job of uncovering their secret past of abuse, neglect, and double-standards for women criminals. Turning these pages will allow you to discover what drove normally proper Victorian women to murder. You'll learn about women's trials, their all-male jury, and the horrid conditions they faced in all-male jails. Goeres-Gardner has written a well-researched book whose real-life characters will stun and amaze you, and make you feel sorrow for some who have long passed away." By Sherry Monahan, Author of The Wild West, Tombstone Treasure, and Taste of Tombstone. Murder, Morality and Madness: Women Criminals in Early Oregon begins with an overview of how women were treated in the nineteenth century when they came in conflict with the law. A list identifying every woman sent to Oregon State prisons between 1854 and 1920 is included. The individual stories are drawn from all over Oregon, beginning in 1854 and ending in 1900. Where possible, they are illustrated with photographs of the women. 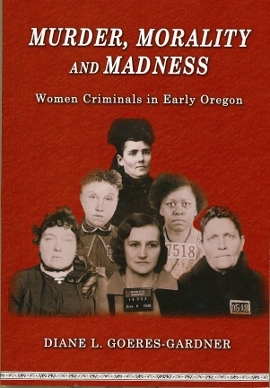 Murder, Morality and Madness: Women Criminals in Early Oregon is published by Caxton Press. You may also find this book on Amazon (click to visit). Murder, Morality, and Madness: Women Criminals in Early Oregon was reviewed on September 12, 2009 by John Terry in his Sunday Oregonian column "Oregon's Trails" with the headline "Women, with few options, turned to violence." Terry also interviewed ex-Oregon Governor Barbara Roberts, a longtime advocate for women's rights. She agreed that "It was not uncommon for women who were menopausal to be put in the state mental institution and never come out again." Terry describes the first case illustrated in Murder, Morality, and Madness: "Charity's saga opens a fascinating array of stories Goeres-Gardner extracted perusing dim newspaper microfilm and yellowing public records." He goes on to say, "No pretty Victorian portraits here. Murder, Morality, and Madness: Women Criminals in Early Oregon is not a look at an ideal 'imaginary woman' writers created to 'populate the Western landscape.' It is instead an arresting assembly of 'a few (who) rebelled with violence and murder.'" Goeres-Gardner was interviewed by Ron Brown of the Medford TV station KDRV on October 2, 2009. "The arrival of the first miners and settlers in the Oregon territory in the 19th century also brought the challenge of how to handle them." "Goeres-Gardner's retelling of the women's situations is very engaging and moving. Regardless of the women or their circumstances, she tells their stories with empathy. The book is well-researched and includes considerable detail about each woman's case. The author credits newspaper articles as her primary source of research, along with court transcripts and statistics from the Oregon State Penitentiary prison registers housed at the Oregon State Archives. Detailed references and footnotes are included at the end of each chapter and photos of most of the women are included throughout the book. There is no conclusion or final comments to bring greater meaning to the women's stories. Despite this drawback, along with a few minor typographic errors, the book provides an informative look at a little-known aspect of Northwest history. I would recommend this book for all libraries interested in collecting materials on women's history in the Pacific Northwest." "Murder, Morality and Madness: Women Criminals in Early Oregon is a true accounting of several fascinating case studies of Victorian women. These women were driven to kill, often under desperate circumstances, and when they were brought to 'justice' it was before all-male juries, and often they served time under insufferable conditions in all-male jails. As much an account of real-life tragedy as it is a solid secondary reference source, Murder, Morality and Madness is thoroughly accessible to readers of all backgrounds and especially recommended to anyone interested in writing fact or fiction about Oregon during this turbulent era of women's inequality." Content copyright by Diane L. Goeres-Gardner, 2014. Awesome Inc. theme. Theme images by mammuth. Powered by Blogger.